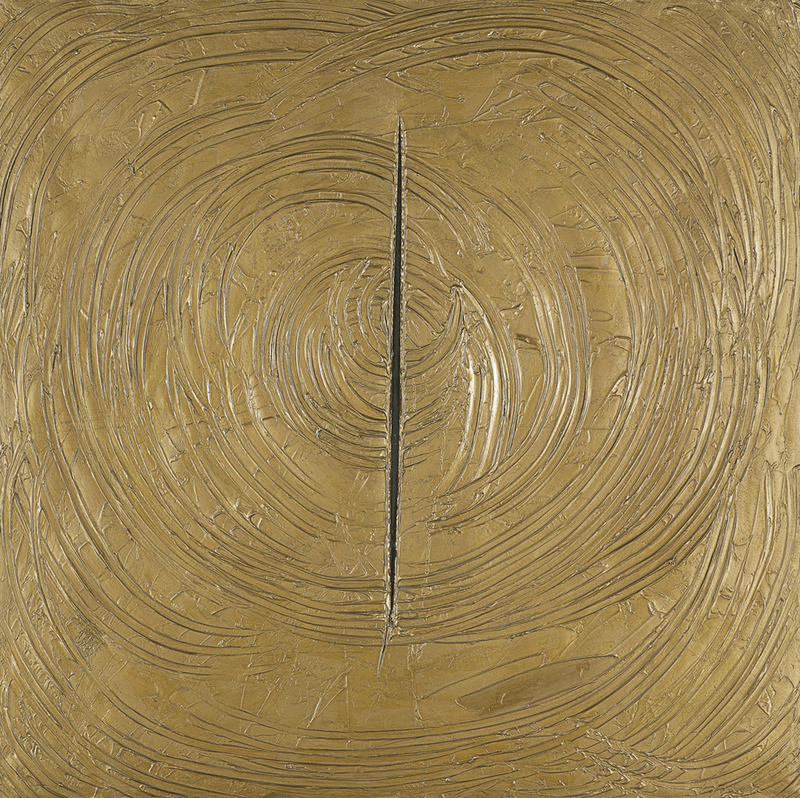 Lucio Fontana, who deliberately eschewed the Art Informel of his time, explained in an interview in the reputable italian magazine Tempo that “Art Informel pursues its aims through gesture...my nature, in contrast, is attracted by space.” Venice Was All in Gold belongs to a series known as Concetto Spaziale. Venezia, which Fontana showed at the Palazzo Grassi in Venice from July to September 1961 in the exhibition curated by the prestigious French critic Michel Tapié, Arte e Contemplazione, which also included the work of Mark Rothko, Antoni Tàpies, Sam Francis and Dubuffet. This Venetian series was later shown in his first exhibition in America held at the Martha Jackson Gallery in New York at the end of 1961 with the title Ten Paintings of Venice, and was never again exhibited as a set. The paintings are now dispersed among various museums and collections. With these “spatial concepts”— as he liked to call his works in order to emphasise their distance from both painting and sculpture — Fontana, an unclassifiable creator who defined himself as a spatial artist, wished to exalt the byzantine splendour of Venice. The artist viewed the city as the island of art, a place of international debate and events that held a special appeal for him. In these paintings which, as Lucca Massimo Barbero has pointed out, are “a culmination of Fontana’s coherent and intellectual poetics, ” he aimed to show the ambivalence between its cultural and imperial past and its present status as a tourist destination that is sentimentally trivialised by the masses. The very titles of the works belonging to the set — Night of Love in Venice, Piazza San Marco in the Sun, The Sky of Venice, Venice – Silver at Dawn, Downpour in Venice, Venice Was All in Gold — are not designed to supply any kind of information about his conceptual creations but to draw the viewer’s attention in the manner of a publicity slogan intended to attract tourists to the city on water. What is more, the large golden spiral has been split into two by one of the artist’s characteristic slashes with a knife. This action of tearing the canvas, typical of gestural and conceptual art, reveals Fontana’s constant concern with going beyond the mere object and discovering the space that lurks behind it, and succeeds in communicating the front and back planes while opening up a means of access to infinity.